Once everything had dried, I could sit back and look at my trees. This is the first one I did. It used some multicoloured merino in the trunk, and two greens from the beginners felting kit I bought on eBay a while back. They’re not very nice greens, but all I’m doing is investigating the technique. There are only two or three layers of wool in this one, which means there are gaps in the felt, and the junction of the trunk and the canopy is a bit flimsy. Gaps in the felt for the canopy are no problem at all – they would help to add depth to the finished piece. Since everything will be caught down (somehow – I don’t yet know how! ), strong, dense felt isn’t really the aim here. The second experiment had the addition of some short staple (that is, short fibre length), very crinkly wool. I was hoping it would result in greater shrinkage, which it has a little. It also produced a greater variety of shades in the canopy, lightening and interrupting that rather dull green. This may have promise, and the felt itself seems a little more stable and would be easier to stitch into. Since the fibres are rubbed and soaped and rolled, and generally beaten up, it’s not surprising that the effects of trying to place the fibre colours to create a particular appearance is, to put it mildly, an inexact science. 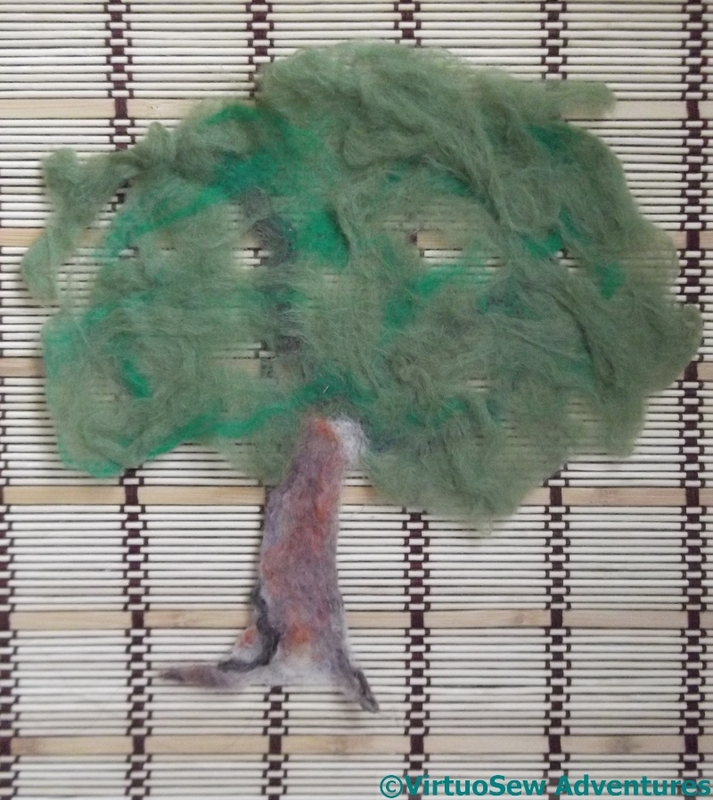 I wonder whether I could combine needle-felting with wet-felting to make the results more controllable? In the final experiment, I added crocheted chains and some tangles of yarn as well. Some parts of the chain didn’t felt in quite as well as I might have hoped, but with more crocheted chain and a better understanding of how to felt it in more thoroughly, it might produce a very good effect. My semi-spun yarn on the trunk has worked, though, and looks even better in real life, although, again, what it needs is the courage of my convictions and rather more of the same. It will be lovely to follow you along on this one, Rachel! Oooh – I just want to go and play with some wet felting and some needle felting ……. but, alas, boxes need to be unpacked first!! O, lovely! They look promising! 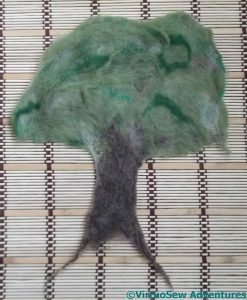 I had a lot of fun with both wet and needle felting several years ago and still have some roving to play with. Maybe I’ll give it another try after seeing your experiments! I enjoyed watching this as you were experimenting on Instagram, and I think it has been very successful! I can see embroidered acorns or grapes fitting in very well on your second tree! Can’t wait to see how you progress with this technique. most definitely not unsuccessful Rachel, from reading this post I can see your brain is ticking and you are benefiting from playing with this. I like the trunk colour in tree one, and the general shape. Yes, the emerald green in the leaves is a bit strong, but it’s a successfully tree-y tree to my eyes. I’d believe that you had used a real oak as a model. Two and three are both a bit too solid-looking in comparison to the first one, and don’t have the look of real trees. of course, a bit of stitching and cutting and so-forth could well perk them up a treat. I just want to reach out and touch those fluffy trees! You are always up to something interesting! I love that you are experimenting. 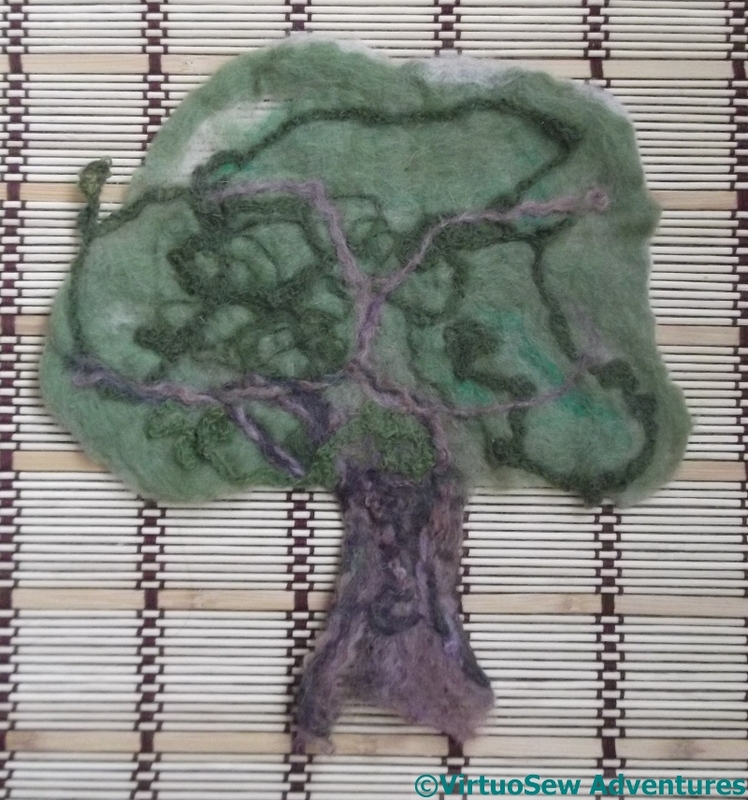 I’ve never tried felting so it is enjoyable to read your process! Happy Creating! 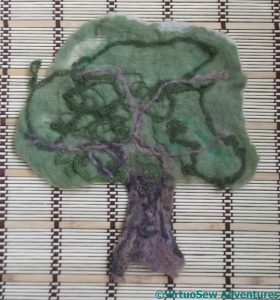 Wonderful – I love this kind of experimentation and I think you could quite easily start with needle-felting, just to manipulate/ensure things stay generally where you want them to be – it should work just fine. I’m very intrigued with this large panel project you have planned. Oh, you were right! You had several more good ideas up your needle! I kind of like the first one, with the spaces. I have yet to see a real tree that doesn’t have some. They are all very usable, though! I think the third one looks pretty good. i was going to suggest needle felting them down onto your backing fabric. It’s a nice tree, nice work you made.